In September I wrote a piece on why I did not think that the future of home entertainment lay in 3-D television. This week, Channel 4 have been showing various programmes in 3-D, and so it seemed like the perfect opportunity to test the potential of the technology. The results were more underwhelming than I had anticipated. No, really – I didn’t think it would be this bad. The first programme of the week was ‘The Queen in 3-D,’ shown in two parts on Monday and Tuesday.It featured too affable gentlemen, Bob Angell and Arthur Wooster, who shot colour 3-D footage of the coronation in 1953. The programme was made of non-3-D sections where we got the history of the coronation, some talking-head segments, which were in 3-D, and the 3-D footage of the coronation. The pair of filmmakers appeared from time to time to ask us to put on or take-off our 3-D viewing spectacles. This take-them-off and put-them-back-on-again soon became irritating. The stongest 3-D effect was in the talking-head segments, but it did not add anything to the social history of the coronation and the effect itself was disappointing. Things do not look any more real – if anything the 3-D effect was quite surreal as the image looked like a series of very flat layers stacked up one on top of the other. It did not have any depth or shape to it. The effect of spatial separation between these flat layers was evident (although, as I have said, not consistently), but it made me think of Ivor the Engine more than anything else. (For my non-UK readers under the age of 25, Ivor the Engine was an animated series created by Oliver Postgate in the 1950s and used stop-motion animation of cardboard cut-outs). 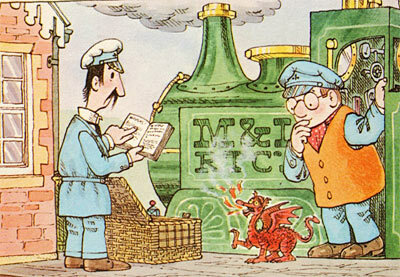 This image of Ivor the Engine was taken from the Walesonline page, where you can find an obituary of Oliver Postgate, who died in December 2008. Imagine this in 3-D, and you sort of get the idea. The flatness of the image was all the more disappointing, as I have recently been re-watching the 3.5 hour long documentary on the making of Blade Runner (Ridley Scott, 1982) that is part of the Ultimate Collector’s Edition Blade Runner box set. This excellent documenatry has a great section with Douglas Trumbull and his fellow model makers, designers, matte painters, special effects cameraman, supervisors, etc. There is a great bit where they explain how they created the image of Los Angeles disappearing into the distance by using flat pieces of brass, so that the city is built up of layer upon layer of this model pieces to create a convincing experience of the immensity of the city. This old fashioned method creating in camera effects through multiple passes over a model landscape, gives a much better effect than 3-D. Obviously it is unfair to compare Channel 4 to the production of Blade Runner, but if we are going to hail 3-D as the future, then it should at least be an improvement on the technology of the past. When I get to see a 3-D landscape as good as that made in 1981, then we can talk about being impressed. Maybe James Cameron’s Avatar will be the film to take us there. But if the ‘last analogue film,’ as Blade Runner was referred to, can achieve such wonderful effects of depth and shape by using flat pieces of brass, 3-D faces a stiff challenge. 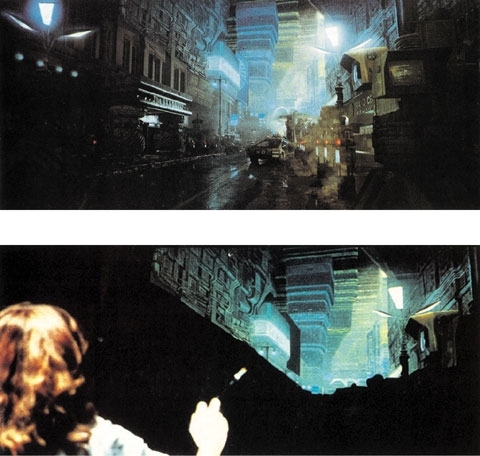 Matthew Yuricich’s matte paintings for Blade Runner are amazing, and better than 3-D. This image is taken from an interview with Douglas Trumbull over at Kipplezone, which is definitely worth checking out. The 3-D effect in ‘The Queen in 3-D’ and the magic programme presented by Derren Brown that followed it was evident in some shots more than others, and this has been a problem through out the week – the inconsistency of the 3-D effect just doesn’t make it seem worth the while.Just as 3-D adds nothing to social history, I found that the magic tricks were harder to follow wearing the 3-D glasses. Also because 3-D television is so rare, I kept looking out for the 3-D effect and missed what was going on with the tricks themselves. I can see the appeal for magic shows to use 3-D – the lack of reality that was alienating in the documentary footage is ideal for illusions. It may that the future of 3-D in the home is limited to some genres of programming – but if this is the case, then selling the audience a new 3-D television is going to be that much harder. I watched the first part of Flesh for Frankenstein (Paul Morrissey, 1973), which is every bit as bad as I remember, and found that even wearing the glasses I could see the amber and blue shapes on the image instead of the 3-D effect. The 3-D effect itself was very intermittent in this film, being quite strong in some shots but barely noticeable in others. As my eyesight is pretty much perfect I don’t wear glasses or contact lenses, and I did not like the fact that I have to wear the 3-D spectacles. They very quickly became uncomfortable, and after a while I started to get a headache. I also burnt my toast. The problem with 3-D in the home is that you do not just watch TV and do nothing else. Rather, the TV is on and has your attention some of the time, while various other things make competing demands on your attention. 3-D seems to depend on the viewer attending to the television screen and nothing else – which is fine in a cinema, where I have made the effort to go out and paid my money with the specific intention of watching the film. But at home I may be talking to another person who is either with me or on the phone, I may be attempting a crossword. My toast was burnt because my attention could not be divided so easily between the screen and the toast, and because I was wearing the 3-D glasses and couldn’t see what was happening. 3-D is all very well as a novelty for films, but once you actually try living a life it falls apart almost instantly. In order to get the best effect, Channel 4 advised you to dim the lights. Well, I don’t have a light-dimmer switch – I have a light on-and-off switch. So now I am sitting the dark, on my own, watching a programme of which only a small part is actually 3-D (and even then the effect is inconsistent), wearing uncomfortable glasses that are giving me a headache, unable to see anything properly, and eating burnt toast. Do you want to come from work and sit in the dark wearing 3-D glasses, ignoring your nearest and dearest while watching underwhelming television programmes? Of course not. A recent article in The Guardian asked the question: Is James Cameron’s 3D movie Avatar the shape of cinema to come? This has been going around in head for a while – along with many other questions of the role of technology in cinema – and the conclusion I’ve come to is that the answer is no – but the answer does not lie in the technology. The film and television industries are technology driven. Although film critics and scholars have spent much of the past century trying to establish cinema as an art (a feat still not yet achieved in the United Kingdom), it is first and foremost a machine, and innovation – from sound to colour to digital – is primarily technological. This is also the case foe consumer electronics: first we are sold a television set, then we are sold a colour television set, then a stereo one, then a widescreen one, then a digital high-definition television set. Without such new features we would not need to purchase a new TV for several years, and the bottom would fall out of the consumer elevtronics market.The next big thing is 3-D home cinema, with 3-D TV’s set to hit homes next year. Techradar has a really interesting post about the efforts of Panasonic and Sony in bringing us the next stage of home cinema entertainment. See also the introduction to the Nvidia GeForce 3D Vision at bit-tech.net. We should be sceptical of such claims for two reasons. First, 3-D home entertainment is all very well, but 3-D cinema is not yet firmly established – largely due to slower than expected roll-out of digital screens around the world. This is especially the case in Europe, and a presentation at the EDCF last year concluded that although it had not actually stalled, the uptake of digital screens was slowing in one of the world’s most important markets. James Cameron’s Avatar may thrust 3-D onto the evening news and the front page of newspapers for a short while, but at an estimated negative cost of $237 million hardly represents a long-term financial strategy for the film industry. Is there really going to be enough product to justify the cost of purchsing a new 3-D television when most films and all television are 2-D? Not at this early stage, and although it is a problem now the lack of content can be overcome in time. It is important ot remember that it took less than two years for the American film industry to convert to sound, and (once the slowdown in digital screens has been remedied) the change to 3-D will probably not be as rapid but will certaintly not be insurmountable in the long-term. Primary: the viewer is focussed on the television to the exclusion of other stimuli. Secondary: the viewer intermittenly attends to the television while also engaged in other activities. Tertiary: the viewer is engaged in an another task and only momentarily attends to the television. We typically only engage at a primary level for particular types of programmes – football matches, inaugurations, moon landings, etc. More often we will be watchin television and talking, cooking, reading, doing the Guardian crossword (badly), reading magazines, trying to work out the functions on a new digital camera, etc. The assumption that 3-D home cinema makes is that the viewer will be engage with television at a primary level only, but this is rarely the case. This is a problem because although the old-style green-red 3-D glasses of the 1950s are no longer needed (they could not cope with the colours of modern films, TV programmes, videogames), some sort of glasses are required (e.g. liquid crystal shuttered glasses). This use of glasses – any glasses – seriously compromises 3-D home entertainment as they do not fit in whith human behaviour. You cannot do the Guardian crossword (badly) wearing liquid crystal shuttered glasses. You cannot keep an eye on the kids if you eyes are busy watching Avatar through 3-D glasses. 3-D glasses are incompatible with all those little private things we like to do when we are at home, and this is the major falling down point of 3-D home entertainment. The major problem is not the technological or economic limitations of 3-D, which can, with time and money, be overcome. The major problem is human behaviour, and if 3-D cannot fit seamlessly into the lives of human beings then human beings will not want 3-D. It does not matter how phenomenal 3-D cinema is if it cannot generate sales through ancillary markets (TV, DVD, Blu-Ray, the Internet), and if it does not fit into peoples’ lives then the limits of these markets will become very apparent. Art and technology are human creations for human beings. If this is not kept as a first principle, we have art that is of no consequence and technology that is of no relevance.